Back in May of 2018, we informed our clients about a potential connection between Grain-Free Diets and Taurine Deficiency Induced Dilated Cardiomyopathy (DCM). This form of Dilated Cardiomyopathy has typically been most commonly seen in Golden Retrievers, so we want to make sure Golden Retriever owners pay special attention to this information. Unfortunately, though, other breeds are now being affected and so this update is now relevant to dog owners of all breeds. Since we first informed our clients of this potential link, the FDA has initiated an investigation and while they are still in the process of completing that investigation, more information regarding this correlation has come to light and we wanted to share with you the most recent and up to date information. While the investigation is still ongoing, the FDA’s Center for Veterinary Medicine (CVM) felt a responsibility to shed light on an early signal that they were made aware of and to solicit reports from pet owners and vets that may know of related cases. The data provided through those reports will help inform the investigation. We also feel a responsibility to share this information with our clients so that you can make informed decisions about your pets’ diets. Due to the potential link between grain-free diets and DCM, we are advising our clients not to feed grain-free, “boutique”, or exotic ingredient diets at this time. Many pet owners began feeding grain-free diets due to a belief that grain-free foods are easier to digest and provide pets with better nutrition than foods containing grain, however this is a myth. If you are currently feeding your pet a grain-free diet, we recommend slowly transitioning them to a diet that meets the World Small Animal Veterinary Association (WSAVA) guidelines (see below). The FDA alert called attention to several dietary ingredients that should be considered when evaluating whether your pet is at risk (for example legumes like peas and lentils, white or sweet potatoes). UC Davis, who first discovered this potential link, considers these ingredients to be of greatest concern when present within the first 5 listed ingredients on the dog food bag. Additionally, it has been noted that a high percent of diets were using protein sources other than chicken or beef and labeled as grain-free. We recommend choosing a food that does not have the ingredients of concern in the first 5 ingredients listed for the dog food you are investigating. Most importantly though, we recommend choosing a diet that meets the WSAVA Global Nutrition Assessment Guidelines published as consensus by veterinary nutritionists from around the world. They advise that pet food diets and the companies that produce them should meet certain requirements to be deemed safe and nutritionally appropriate. At this time, we know that Royal Canin, Purina, and Eukanuba diets all meet the WSAVA guidelines. They all have Board Certified Veterinary Nutritionists on staff as well as PhD Animal Scientists and PhD Nutritionists that work throughout various levels of the companies. As pet owners, we know you only want to do and feed what is best for your pet and we would be happy to discuss transitioning your pet to one of these diets. Below we’ve included some some Frequently Asked Questions about Grain-Free Diets and Taurine Deficiency Induced Dilated Cardiomyopathy from the FDA’s website. If you have additional questions, please don’t hesitate to call our office at 540-776-0700. What is Canine Dilated Cardiomyopathy (DCM)? DCM is a disease of a dog’s heart muscle and results in an enlarged heart. As the heart and its chambers become dilated, it becomes harder for the heart to pump, and heart valves may leak, which can lead to a buildup of fluids in the chest and abdomen (congestive heart failure). If caught early, heart function may improve in cases that are not linked to genetics with appropriate veterinary treatment and dietary modification. What potential connection is the FDA investigating? FDA is investigating a potential dietary link between canine dilated cardiomyopathy (DCM) and dogs eating certain pet foods containing legumes like peas or lentils, other legume seeds, or potatoes as main ingredients. We began investigating after FDA‘s Center for Veterinary Medicine (CVM) received a number of reports of DCM in dogs eating these diets. DCM itself is not considered rare in dogs, but these reports are unusual because many of the reported cases occurred in breeds of dogs not typically genetically prone to the disease and were reported to have been fed the same type of diet (labeled as “grain-free”). What is the FDA doing about this possible connection? The FDA’s Center for Veterinary Medicine (CVM) and the Veterinary Laboratory Investigation and Response Network, a collaboration of government and veterinary diagnostic laboratories, are investigating this potential association. We are working with board certified veterinary cardiologists and veterinary nutritionists to better understand the clinical presentation of the cases. The agency has also been in contact with pet food manufacturers to discuss these reports and to help further the investigation. In addition, we are analyzing information from case reports submitted by pet owners and veterinarians. We will continue to work with all of these stakeholders to help advance our ongoing investigation. What brands of food have been included in the reports to the FDA? There is a range of different brands and formulas included in the reports. Rather than brands, the common thread appears to be legumes, pulses (seeds of legumes), and/or potatoes as main ingredients in the food. This also includes protein, starch and fiber derivatives of these ingredients, (e.g., pea protein, pea starch, or pea fiber). Some reports we have received also seem to indicate that the pets were not eating any other foods for several months to years prior to exhibiting signs of DCM. 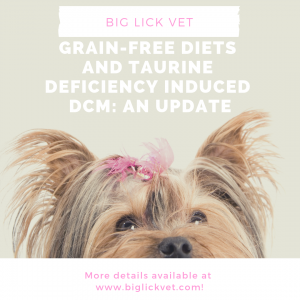 While it is not clear what it is about these diets that may be connected to DCM in dogs, taurine deficiency is well-documented as a potential cause. However, other factors could be involved, such as nutritional makeup of ingredients, how dogs process them, ingredient sourcing, processing, and amount used. If you suspect your pet is showing signs of DCM or if you have any questions regarding the information in this post or your pet’s diet, please call our office at 540-776-0700.